On the 15th September, I had my first "tourist trip" and took the Bangkok River Tour. This is an all-inclusive trip for tourists, taking half a day, and visiting a famous temple, the Royal Barge museum and the Royal Palace. Departure is at 9:00am from "Central Pier", one of the many piers along the Chao Phraya River on whose banks Bangkok is built. Cost, 780baht, approximately £11.50. The trip is organised by the Chao Phraya River Boat company, a family business owning most of the river taxis and tour boats used in Bangkok. The boat used for this tour seats around 40 passengers, but is rarely full … our guide was happy to have so many customers, and there were around 15 of us! The guide speaks perfect English, and gives a non-stop spiel of Thai history and culture, in a very light-hearted and humorous way as you travel up river. Wat Arun was so named as it the first temple the king saw as he travelled down the Chao River one day, seen in all its glory as the dawn broke. The temple dates back long before Bangkok was built, and is still a highly revered Buddist site. The approach from the river gives a stunning view as you can see - all the pictures on this report were taken by me! The steps leading up to the temple get incredibly small and steep, but at the time of writing only the first level was open to the public. You are given 15 minutes here before it is time to get back on the boat. This is where you discover how thoughtful the Thais are... first you are given a chilled towel to mop away the sweat from your sightseeing in the sun, and then a bottle of iced water to drink en-route to the next stopping point. 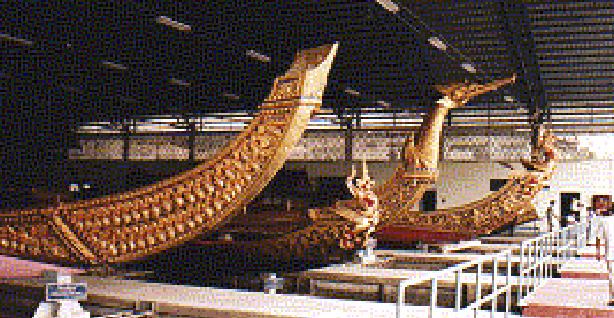 The Royal Barges used to be used in an annual procession of some 42 barges! Now they are used only for special occasions, it is thought the next occasion will be the crowning of the new King, whenever the present one gives up the throne! They are still impressive to see though, even in the shed/museum where they are stored. The temple is the holiest site for Buddists in Thailand, and all Thai Buddists are encouraged to visit the temple at least once in their lifetime. The temple contains the statue of the Emerald Buddha. No one knows exactly when the statue was made, or who by. According to a reliable chronicle, it was discovered in 1434 when lightning struck an object in a temple, and a statue of Buddha, covered in Stucco was found inside. Later, when the stucco began to peel, a green colour was noticed, the stucco fully removed, and the remarkable Buddha, carved from Jade found underneath. The statue is dressed in one of three costumes depending on the season, as can be seen in the picture above taken from a postcard. Hope you enjoyed this trip!